The Iiniskim Powwow Committee presents a cross-cultural gathering of indigenous nations and the Banff community. “Iiniskim” means buffalo stone in Blackfoot and it is a sacred buffalo calling stone (click here). Iinniistuk refers to the mountain in Banff shaped like a sleeping buffalo. The Stoney Nakoda Nation is lobbying Parks Canada to change the name of Tunnel Mountain from Sleeping Buffalo Mountain to Sacred Buffalo Guardian. The mountain sits at the center of the Banff area, at the cross section of five valleys, and has been a place for learning, vision quests, and ceremonies for thousands of years. The Iiniskim Cross-Cultural Powwow will feature drumming, singing, regalia, dancing, and cultural education, and everybody is welcome to take part or observe. Participants can compete for prize monies in 9 categories of adult dancers and 7 categories of teen and junior dancers and tiny tots. 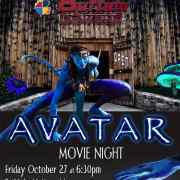 There will also be social dances for all participants and spectators to join. No regalia or dance outfit is required for social dances or inter-tribals. Not only is a Powwow a sports competition, but also this powwow honors and shares knowledge of the ceremonial traditions and protocols of a powwow celebration. The 2nd Annual Iiniskim Powwow will pay tribute to Norman Luxton; known as “Mr. Banff”, he was a Stoney honorary chief and formed deep friendships with indigenous people. The event venue will be open for a full day of scheduled programming, beginning with the indigenous art market open 11 am – 10 pm; then grand entries and competition begin at noon and 6 pm, finishing at 10 pm. The Powwow is led by a professional arena director and powwow announcers, who will explain the songs and dances as they unfold. 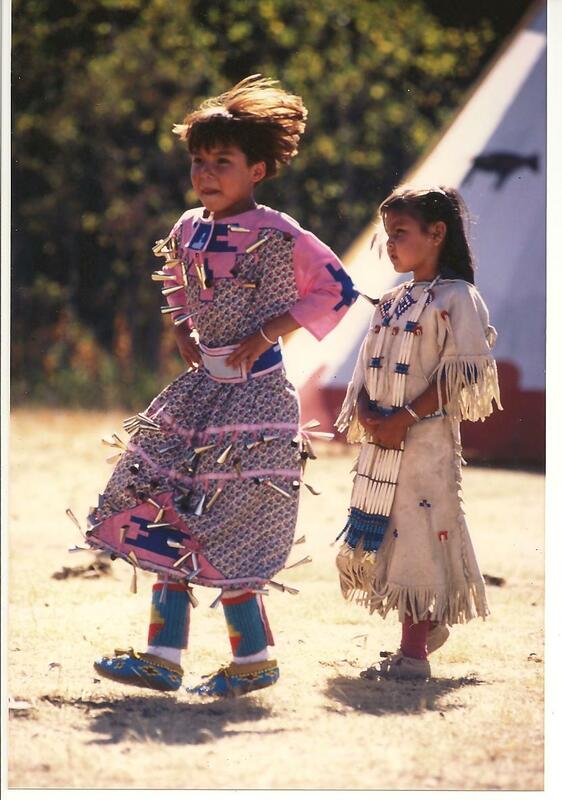 This year the powwow has invited a world champion to perform special demonstrations of hoop-dancing. Visitors and participants will have the opportunity to purchase food and non-alcoholic beverages from the concession. A marketplace will be set up by local vendors with exceptional quality indigenous art and crafts for sale. Interested vendors can contact banffpowwow@gmail.com. Out of town visitors can look up www.banfflakelouise.com/Places-to-Stay for accommodation options. Interested in helping out? Please email banffpowwowvolunteer@gmail.com and include your name, phone number, the times you are available, and if you have a preferred area to help out. 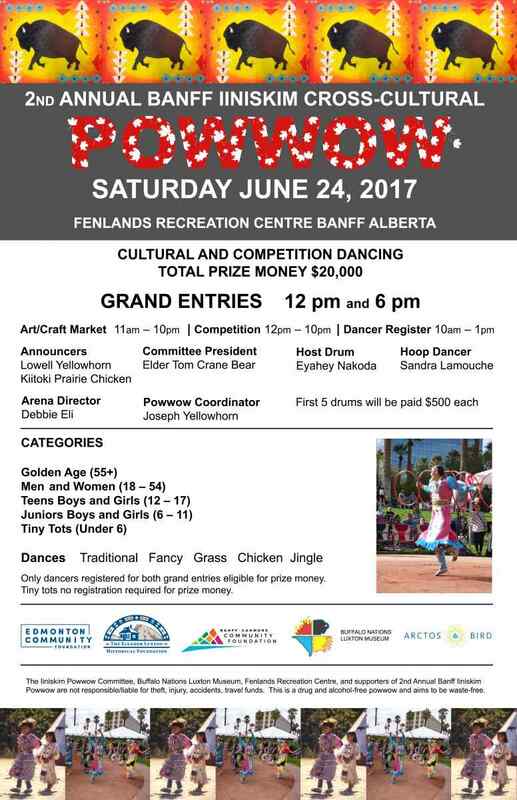 banffpowwow@gmail.com for more information about the event or market booth reservation.